In this week’s episode, we cover our favorite thing every year, the annual Association of Professional Piercer’s convention in Las Vegas. This year marks the 24 year of this event. It also marks a change of venue from Bally’s to The Planet Hollywood Casino and with that comes a whole bunch of new and exciting things. We sit down with one of my dearest friends and honorary co-host for these conference episodes. 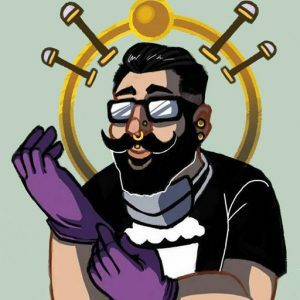 Cale Belford, owner of Uzu Organics and Oleander piercing joins us again to tell us all about the new hotness that conference has and to go over how to survive a week long convention. So without further ado, listen in as we talk about how to survive for first timers, what’s new for repeat attendees and what amazing things are in store for you. Cale can all be found on her personal Instagram, her jewelry company or in her studio.